We are pleased to host an exclusive workshop on face reading by world renowned expert Eric Standop. Face reading techniques can be used to identify a person’s talents and opportunities, assess health and character, and plan for future well-being. 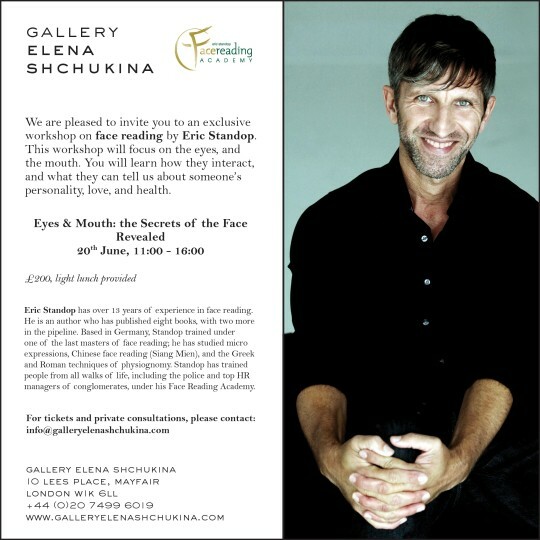 This workshop will focus on two key facial features: the eyes, and the mouth. You will learn how their shape and movement can give a deep insight into a person's emotions and thoughts, and what they can tell us about someone’s personality, love, and health. Eric Standop has over 13 years of experience in face reading. He is an author who has published eight books, with two more in the pipeline. Based in Germany, Standop trained under one of the last masters of face reading; he has studied micro expressions, Chinese face reading (Siang Mien), and the Greek and Roman techniques of physiognomy. Standop has trained people from all walks of life, including the police and top HR managers of conglomerates, under his Face Reading Academy.